Dietary fiber is an essential component of any healthy meal plan. In Western cultures the daily consumption of fiber is about half of the minimum amount recommended. We should be consuming 20 to 35 grams of fiber each day. Fiber is interesting because it is something you actually can’t digest. So, why is it so important? Fiber stays intact as it moves through your digestive tract. It is this bulky material that helps your bowels to empty, taking with it impurities, harmful bacteria, and toxins. You need fiber for bowel regularity. Otherwise, you can become constipated and quite ill. Fiber is also attributed to lowering risks of cardiovascular disease by preventing hypertension, lowering blood glucose levels, reducing LDL cholesterol, and helping to maintain an appropriate body weight. Fiber comes in two forms. Soluble fiber is the type that becomes gel-like when mixed with fluids, especially water. This can be very soothing as it coats your intestines. Insoluble fiber swells as it absorbs fluids, making it bulkier. The added bulk is what pushes the junk through and out of your intestines, notable the colon. Both are necessary and work together to protect and cleanse. Lots of fiber comes from foods that are also rich in carbohydrates, such as grains and legumes. This is a double edged sword. While you want to sweep your intestines clean, we don’t want to feed your body too many carbohydrates. A diet that is too high in carbohydrates can cancel out the wonderful properties of fiber. Certain carbohydrates convert to sugar long before they are eliminated from your body, either by being used as fuel or being digested and removed through bowel movements. These sugars can ferment, contributing to yeast overgrowth. They can also spike blood triglyceride levels and contribute to LDL cholesterol. So, how can you get more fiber while consuming fewer carbohydrates? There are many foods you can incorporate into your diet that are high in fiber and lower in carbohydrates. You don’t need to give up your grains and legumes, just cut back and eat more of the foods discussed here. As well, be sure your grains are whole and not refined. Yes, you will have to be mindful of your shopping, meal preparation, and what to order when out. The effort will be rewarded with the health benefits. Enjoy the experience, knowing this is good for you. Let’s explore some of the food options available to you that have a good ratio of dietary fiber to carbohydrates, by category. 100 grams of asparagus has 2.1 grams of dietary fiber and 3.38 grams of carbohydrates. Asparagus grows perennially, peaking in mid-spring to early summer. The stalk is very fibrous. It is delicious when cooked just until tender by lightly steaming, oven roasting, or grilling with a little olive oil. The flavor of asparagus is unique and pairs well with heavier proteins and mashes. It is a good source of vitamin A and copper. 100 grams of Bok Choy has 1 gram of fiber and 2.18 grams of carbohydrates. Bok Choy is a sturdy cruciferous vegetable with a crunchy base and broad leaves that lends itself well to Asian stir fry dishes. It is a great source of vitamins A, C, and K, carotenes, and antioxidants. Antioxidants fight the damaging free radicals that contribute to premature aging and disease. 100 grams of broccoli rabe has 2.7 grams of fiber and 2.85 grams of carbohydrates. This bitter, leafy and flowering vegetable can be steamed or sautéed, and seasoned with garlic and lemon to quell the bitterness. Broccoli rabe is a great source of minerals, such as calcium, iron, and magnesium. 100 grams of radishes has 1.6 grams of dietary fiber 3.4 grams of carbohydrates. Crisp radish bulbs and the greens are both delicious eaten raw in salads. They are both spicy and cooling. Radishes contain sulforaphane, an antioxidant which is known to aid in the prevention of various types of cancer. 100 grams of spinach leaves has 2.2 grams of dietary fiber and 3.63 grams of carbohydrates. Spinach is a dark leafy green. It can be eaten raw in salads, sautéed, or added to soups and stews. Spinach is quite high in vitamin A. It is also a great source of calcium, required for bone health, and iron, needed blood health. 100 grams of Swiss chard has 1.6 grams of dietary fiber and 3.74 grams of carbohydrates. Swiss chard is another dark green leafy vegetable with a colorful, edible, and fibrous stalk or rib. It is a wonderful source of vitamin K. It can eaten raw, sautéed with garlic and olive oil, or braised. You can also pickle the crunchy ribs. 100 grams of zucchini has 1 gram of fiber and 3.11 grams of carbohydrates. Green and yellow zucchini, also known as summer squash or courgettes, contains no saturated fat or cholesterol. Zucchini is an important source of potassium. It can be sautéed, grilled, or stuffed and baked. It is a favorite in the Mediterranean Diet. 100 grams of avocado has 6.7 grams of dietary fiber and 8.53 grams of carbohydrates. Avocados are loaded with fiber. The flesh of this unique fruit is creamy, fatty, and savory. Avocados are one of the best sources of mono-unsaturated fatty acids that are vital to lowering LDL cholesterol. The flesh is best enjoyed raw on salads, in guacamole, or as a creamy element blended into smoothies. You can also use it as a sandwich spread in place of mayonnaise or mustard. 100 grams of blackberries has 5.3 grams of dietary fiber and 9.61 grams of carbohydrates. Blackberries are best eaten at their peak of ripeness. Eaten too soon will result in a terribly tart sensation. Eaten too late they will be mushy. You can use them in pies, jams, fruit salads, and berry compote sauces. Or, just toss them whole on yogurt or ice cream. They are a great source of both soluble and insoluble fiber, which is beneficial to digestion. They are also a decent supply of copper. 100 grams of gooseberries has 4.3 grams of dietary fiber and 10.18 grams of carbohydrates. Gooseberries are not always available in markets. They thrive in humid summers and severe winters. Perhaps that is why they seem prevalent in Northern European climate zones. They are available in a variety of colors. Gooseberries are high in anthocyanins and flavones, the compounds that are responsible for fighting aging, cancer, and inflammation. The tart berries are used to add flavor to cooked, savory, protein dishes. The ripe berries are generally eaten by the handful. 100 grams of mulberries has 1.7 grams of dietary fiber and 9.8 grams of carbohydrates. Wild mulberries are native to North America and Asia. They are very similar in structure to blackberries. In fact, mulberries are prepared in the same manner. Resveratrol is one of the key components in mulberries, similar to red grapes. Resveratrol reduces constriction of the blood vessels, thereby lowering blood pressure and preventing stroke. 100 grams of nectarines has 1.7 grams of dietary fiber and 10.55 grams of carbohydrates. Nectarines are a stone fruit that is similar to a peach in texture and flavor. They have a smooth skin, rather than the fuzzy skin a peach has. Nectarines have a floral aroma. The best way to eat them is right off the tree when they are ripe, just like an apple. The skin and flesh are edible, not the stone. This is a great source of vitamins A and E, as well as the B vitamins. 100 grams of peaches has 1.5 grams of dietary fiber and 9.54 grams of carbohydrates. Peaches are perfect for pies and cobblers, or cooked into chutneys. You can braise tough cuts of pork with sweet peaches, or make a barbeque sauce from them. The best way to eat a peach is to grab it fresh off the tree with plenty of napkins to catch the ripe, sweet juice. Peaches are lower in sugar than you might think. They are also a good source of vitamins and beta-carotene. 100 grams of strawberries has 2 grams of dietary fiber and 7.7 grams of carbohydrates. Strawberries are sweet and tart, seeds and all. You can easily just eat them with your fingers, dip them in warm dark chocolate or honey and yogurt, or blend them into smoothies. Fresh berries are rich in vitamin C, a powerful antioxidant. Strawberries are low in calories and relatively low in carbs for a fruit. 100 grams of star fruit has 2.8 grams of dietary fiber and 6.73 grams of carbohydrates. Star fruit is one of the lowest carbohydrate fruits. The firm skin of the fruit is a good source of dietary fiber and is just as edible as the flesh. This fruit is both sweet and tart. It is great all by itself, mixed into fruit salad, used as a garnish, or even pickled. Star fruit contains quercetin, an important flavonoid that is beneficial to cardiovascular health and has been shown to be helpful with seasonal allergies. 100 grams of tomatoes has 1.2 grams of dietary fiber and 3.9 grams of carbohydrates. While technically a fruit, tomatoes are mostly used in savory recipes. They can be eaten raw or cooked. Tomatoes are typically the base for sauces in Italian and Mexican cuisines. They are a rich source of lycopene, a flavonoid antioxidant. Lycopene may help protect cells and other structures in the human body from harmful free radicals. 1 tablespoon of chia seeds has approximately 5.2 grams of dietary fiber and 6 grams of carbohydrates. Chia seeds are native to Mexico, Central America, and South America. These little seeds are calorie dense, but those are mostly from polyunsaturated fatty acids. They are rich in omega 3s, antioxidants, and dietary fiber. Chias are also loaded with calcium and phosphorous. When the seeds come in contact with water they turn to a gel, making them a great thickener for smoothies. They also add plant based protein to any dish. 1 tablespoon of ground flax seeds has approximately 2.8 grams of dietary fiber and 3 grams of carbohydrates. Flax seeds are a super food that has both soluble and insoluble fiber. They are also really low in carbohydrates. Flax seeds will expand in the presence of liquid. That is why they are used in place of eggs as a binder in vegan dishes. Flax seeds are rich in omega 3 fatty acids – the good fats for heart health. They are also an excellent source of vitamin E. Like chia, flax is a good source of plant based protein. These seeds are used in baking or sprinkled raw on cereals and soups. A little goes a long way. 100 grams of pumpkin seeds has 6 grams of dietary fiber and 10.71 grams of carbohydrates. Pumpkin seeds are pretty amazing. When chewed raw, they are reported to expel parasites and worms from the intestines. These seeds contain glutamate and tryptophan. Both nutrients are essential for mood enhancement and sleep regulation. Pumpkin seeds have a mild flavor when eaten raw. They are often toasted or coated in salt to eat as a snack. 1 tablespoon of rice bran has 1.5 grams of dietary fiber and 3.7 grams of carbohydrates. Rice bran is the outer layer of brown rice that is removed in order to make polished white rice. Bran helps in the reduction of cholesterol because it contains the antioxidant gamma-oryzanol. Bran also helps with bowel regularity. It can be added to baked goods or sprinkled on a bowl of yogurt or fruit. It has a slightly nutty flavor. 1 tablespoon of wheat bran has 1.6 grams of dietary fiber and 2.3 grams of carbohydrates. Wheat bran is the outer shell if the wheat plant that is removed in the processing of wheat into flour. It is known for its high fiber content and eaten primarily for its gut motility benefits. Wheat bran helps in the prevention of cancers of the gastrointestinal tract. It is also a good source of niacin, vitamin B6, and iron. Wheat bran can be used in baked goods or added raw to smoothies or yogurt. Most fiber sources are actually carbohydrates. The difference is that dietary fiber does not contribute to increased blood sugar levels the way most simple carbohydrates can. 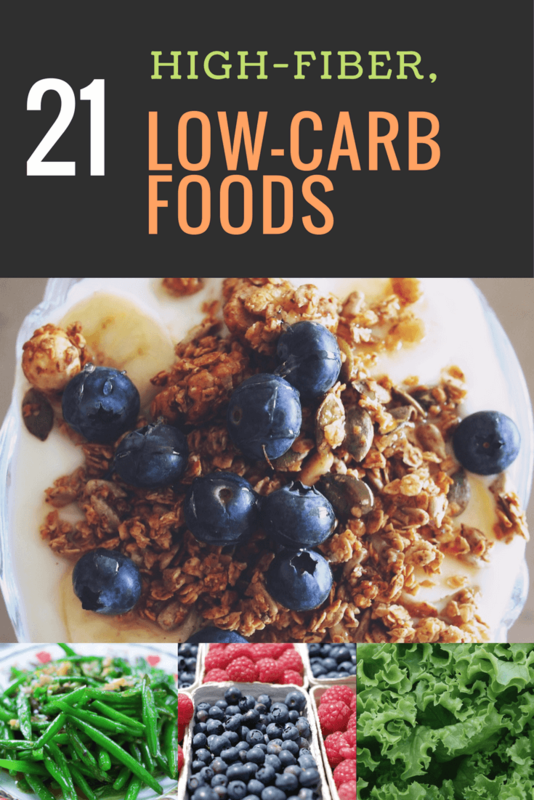 If you are on a low-carb diet, fiber can help to reduce the effect that carbohydrates have on the blood stream. Dietary fiber fills you up the same way carbohydrates do, but without the sugar spike. This may contribute to weight loss. The benefits of dietary fiber are more than just keeping your colon moving along smoothly. Bowel regularity is a wonderful thing and necessary for overall health. But, fiber does so much more, especially when you are cutting back on carbs. As already mentioned, fiber can lower the negative impact of the consumption sugar and starch on blood glucose levels. A high-fiber diet has been linked to a reduced risk in developing pre-diabetic conditions, type II diabetes, obesity, heart disease, and gastrointestinal disorders and cancers. As a rule, daily adult caloric intake should include a minimum of 20 to 35 grams of fiber. This should be both soluble and insoluble fiber. You can easily do this by incorporating more of the foods outlined above into your diet. It is also recommended that you cut back on simple carbohydrates. Grains should be unrefined and whole. Legumes should be soaked and cooked well. Nuts and seeds are best in raw form. White or castor sugar should just go away and be replaced by stevia, pure maple syrup, or raw honey (used sparingly). Cutting out processed foods is ideal, but can be accomplished slowly. If possible, choose organic produce and pasture raised proteins. As with any dietary plan, it is advised that you speak with your healthcare professional or nutrition expert before making drastic changes. A simple blood test, such as a lipid panel to determine cholesterol and triglyceride levels, is a good idea. You might also benefit from food sensitivity testing. Food and oxygen are what sustain us. So, be cognizant of what you put into your body. And move about in fresh air to get the oxygen your blood and muscles rely on. Most importantly, enjoy the journey. Your site is frickin’ awesome and I’m going to buy that Keto book for myself and then give a couple for Christmas as well. I’ll be checking in often. So, I have been doing the Keto diet for 8 months and have lost 35 pounds. I am in the “senior citizen” category and this is the only diet in my life that I have been able to stick to. A year ago I was considered pre-diabetic and have had abnormal liver functions for at least 15 years (diagnosed as fatty liver). My cholesterol has always been normal. I had blood work when I had been on the diet for 3 months. My A1C dropped and I am no longer pre-diabetic. My liver functions came back totally normal (that was a shock) and my cholesterol went down. I was really pleased with these results. So my reason for this post is to help others. 3 days ago I landed in the hospital with Diverticulitis. The doctors were very clear that keto did NOT cause this disease – it takes years for the pouches to form in the intestines – however, it only takes one piece of food to get stuck in the pouch to cause a bacterial infection. My “go to” snack was nuts. I also was not eating enough fiber – which is what brought me to this web page. I had no idea that these pouches had formed. So my advice moving forward to others is make sure you chew nuts really well and make sure you get AT LEAST 35 grams of fiber EVERY day. I hope this helps others. Hi Connie, I can relate to this as well. I have been doing Keto for 6 months and down 60 pounds and loving it. I too landed in the hospital with Diverticulitis after 5 and half months of Keto. I was discouraged as I thought I would have to give up on Keto (the only way of eating that I have been able to stick to as well) . I had heavy doses of antibiotics and liquid diet for 5 days. My go to snack was blackberries and raspberries and lots of them!! Those seeds probably got stuck in the pouches , as they can’t really be chewed, so I avoid them now. Never want to have that pain again!! I did find a tea that works wonders and keeps the inflammation down, its called Rachels Tea (online), It helps with flare up, soothes the stomach, and prevents constipation. Fiber is now my friend 🙂 . I found the information here very helpful. Hi Ladies, I am also doing Keto and found an amazing source for a wonderful fiber product with 10 g of soluable fiber versus Metamucil 2 g. My Cholesterol was up a bit as well so I am excited to see my next lab results. The sugar free version is also only 3 net carbs for the berry flavor and 6 for the orange. ( so it’s Berry for me ) Connie, I am thrilled to hear it helped with your liver function tests because I will now have my Mom ( Connie as well ) start using this Fiber drink as well. Hopefully it helps her as well. ThankYou so much Connie and Sue. I am so glad that I found this site. Great information all around. Can you please let me know what fiber drink product this is that has 10 g of soluble fiber? I have searched all over and cannot find anything like it. Thank you so much! Hello! This article was very informative! Can I add something like a Metamucil as a fiber supplement to achieve the same benefits as eating the seeds/bran? Thanks!